Handprint crafts are a huge hit in our house for both my preschooler and toddler. 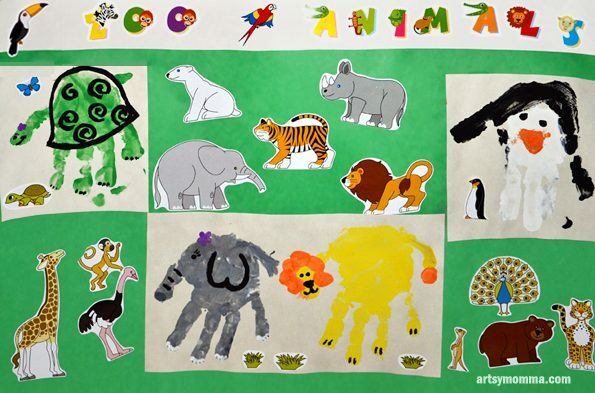 When I saw the animal-themed stickers in the Fonts & Letters Sticker Collection by Melissa & Doug, I thought it would be perfect for a zoo animals made from handprints art project for my kids to make together. I asked my son to choose 4 animals to make that could be found at a zoo; 2 for him and 2 for his little sister. He chose a penguin and lion for himself and for his sister he chose a turtle and elephant. *This post originally appeared on the Gummy Lump Toys blog. Have all your supplies ready and your work surface covered. Choose your construction paper. We chose off-white and green. Optional: have a wipe or washcloth ready for spills. For this 1st part, we used the off-white construction paper. Place animal-themed font stickers so they read “Zoo Animals” across the top. 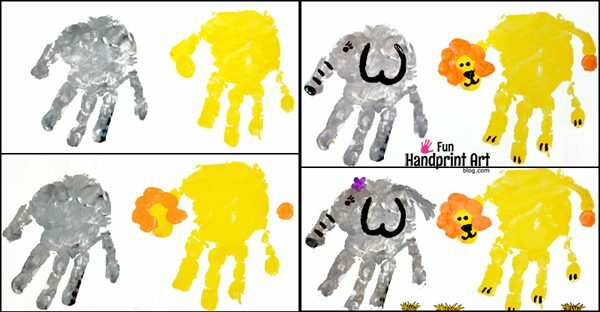 Make the handprint animals (see individual instructions below). When each animal is finished, cut around them as well as around the sticker words. Glue the pieces to another sheet of construction paper- we used green. Paint the thumb and pinky finger with black paint as well as along the bottom of the palm connecting the 2 areas. My son said it looks like a “J” (cute!). Paint the rest of the palm and middle 3 fingers white. It should look like shown in the photo example. The white area makes the tummy and face and the black area creates the penguin’s wings and head. Let dry. Paint on an orange triangle for the beak. My son gets frustrated with shapes, so I lightly drew a triangle on for him with pencil which he then painted in. Add 2 black dots for eyes. Make a green handprint and let dry. The 4 fingers should be pointed down to create the legs. 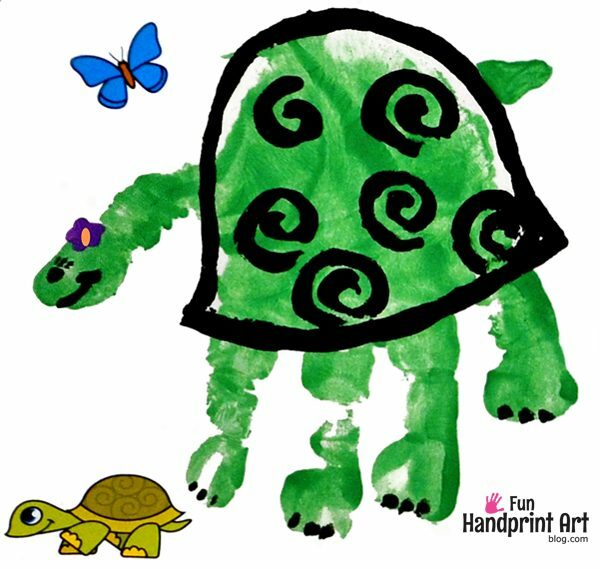 Using either a thin paintbrush or a black marker, draw an outline of a turtle shell around the palm area. Decorate inside the turtle’s shell with shapes; we chose to do curly cues! Paint or draw on an eye, mouth, and toes. Optional: to make our turtle girly, I added on eyelashes and a flower. Lastly, paint on a green tail. Make a gray handprint. Paint a gray tail and let dry. At the tips of the fingers, add 4 teeny white dots to make elephant toes. Draw or paint on eyes, a ear, and the elephant trunk details. Optional, I added eyelashes and a flower to make it a girl elephant. Make a yellow handprint with the fingers pointed downward. Add a yellow thumbprint just below where the thumb is on your handprint (see photo for example). This part will be the lion’s face. Add brown or orange thumbprints in a circle around the lion’s head except for at the very bottom of the thumbprint. Add a thumbprint for the lion’s tail. Have the child paint a yellow line connecting the handprint and thumbprint to finish the tail. Add eyes, a nose, a mouth, and toes. 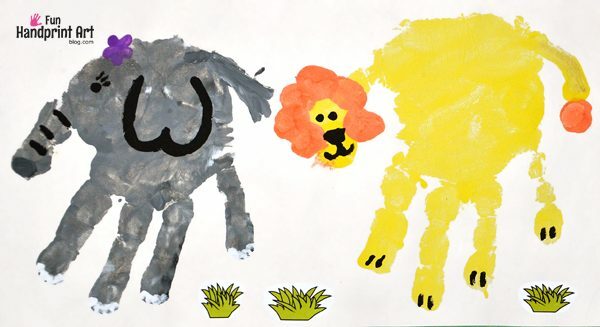 My son did most of the details for his 2 handprint animals, but did not want to do the lion’s face so I helped him with it. Since my daughter was too young to draw the details on her turtle and elephant, I did it for her. Big Brother said he was too tired to do her animals otherwise it would have been cute for him to do instead of me. I love that it made a fun craft for them to create together, but it would be just as fun for each child to make their own too! 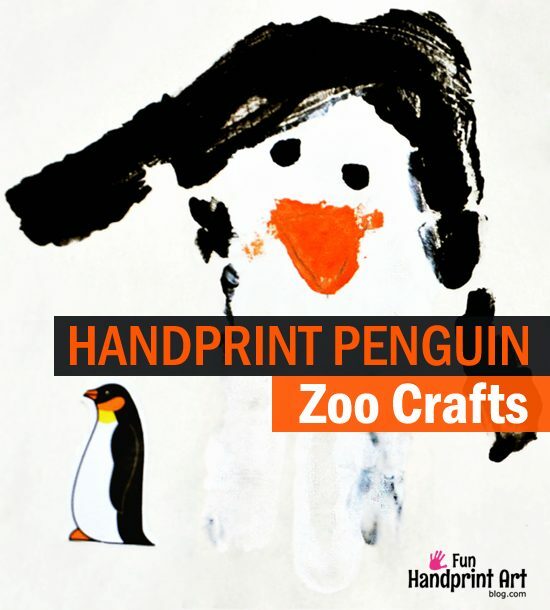 If you’re looking for more zoo animals made with handprints, you may like this polar bear craft, monkey craft, and zebra craft. These are so adorable, we love handprint crafts!